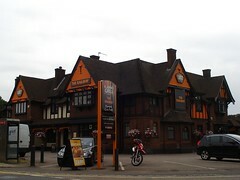 Pub near Greenford Station, part of the Flaming Grill group. It's fairly big inside, with a few different areas: a pool room with bright orange pool table and high stool seating, a dining area, and a regular bar area. There are plenty of TV screens, though it's big enough that you can get away from these. There are also tables outside, under parasols. The interior decor is themed around orange, red, and purple, presumably to echo the "Flaming" part of the theme. Kake visited again on a Tuesday lunchtime in July 2013. There was only one real ale available (London Pride), though another handpump was marked for White Horse Village Idiot "coming soon". A pint of lime and soda was an impressively-cheap 30p. Music was playing, not too loud, and the flatscreens were showing Sky Sports News with subtitles and the sound off. There were a few people already in when I arrived around 12:30pm, some having lunch. Service was very friendly. According to signs seen in July 2013, quiz night is Thursday from 9pm and there's live music on Saturdays. They have free wifi via The Cloud (and in July 2013, Kake's existing free account worked fine). Ewan's verdict: Probably your safest bet in this part of town. Accessibility: A small step to get in, and a somewhat heavy door. No steps to the ladies', didn't check the gents'. There's a fairly large car park. Child-friendliness: They have a children's menu. Last visited by Kake, July 2013. Opening hours taken from the Flaming Grill website, July 2013. Last edited 2013-07-04 08:26:44 (version 8; diff). List all versions. Page last edited 2013-07-04 08:26:44 (version 8).